I’ll admit, when I first heard the title “Crazy Rich Asians”, I thought this was some insensitive comedy spoof. Turns out, it might be one of the most talked about and celebrated films of the summer. It’s based off a best-selling book that is the first part of a trilogy; something Warner Bros. hopes to turn into an international franchise (i.e. “My Big Fat Greek Wedding”). While the underlying plot of “Crazy Rich Asians” is anything but new, director Jon M. Chu says if Hollywood wants to continue making the same stories over and over, they must come from different perspectives. It’s the first time in 25 years that a mainstream American film has been released with an all Asian cast. It’s a vibrant, often hilarious and touching movie that celebrates love, culture and extravagance. When humble New York economics professor Rachel Chu (Wu) agrees to accompany her boyfriend Nick Young (Golding) back home to Singapore for a friend’s wedding, she didn’t understand what she was getting into. Nick, of the wealthy Young family is one of the most well known and rich families in all of Asia, a part of himself he has hidden from his girlfriend of over a year. Rachel isn’t rich, nor from a predominant family, in fact, just the opposite. Her former college friend Peik Lin Goh (Awkwafina) explains to how things work in the wealthy society of Singapore. 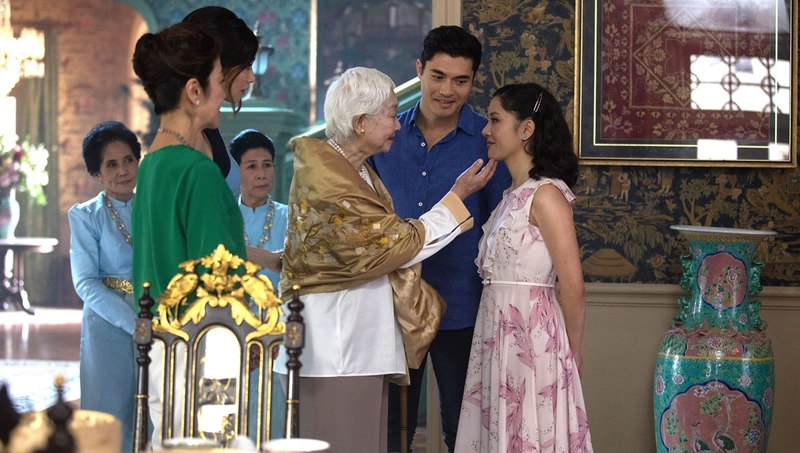 Nick’s controlling mother Eleanor (Yeoh) doesn’t mix words or hide behind substiles when telling Rachel she will never be good enough for their family. Awkwafina has the most memorable and praise worthy supporting actress performance of the year. Virtually unseen on the big screen, Constance Wu makes the leap from television to film, with what appears to be a promising career ahead. She grounds the film as the viewer’s way into the story, much like what Dakota Johnson did in “Fifty Shades of Grey“. Awkwafina who had a minor breakout earlier this year in “Oceans 8”, steals the show as the eccentric best friend. Her comic relief is perfectly timed, adding similarly what Melissa McCarthy did for “Bridesmaids”. I would go as far to say that Awkwafina has the most memorable and praise worthy supporting actress performance of the year. Despite being the stories antagonist, Michelle Yeoh (“Crouching Tiger Hidden Dragon”) personifies old world charm and class. You both admire and hate her at the same time. The male actors in the story however are cast for their eye candy contribution and little else. Henry Golding was even a contestant on the Bachelorette, which makes one particular joke in the script even more ironic. Director Jon M. Chu who was until now only known for his work on Justin Bieber’s “Never Say Never” or the fall guy for sequels no one wanted (“G.I. Joe Retaliation”, “Now You See Me 2”, “Step Up 2”) finally has a product he can be proud of. There is no expense spared on filming locations, including party barges, remote islands and the most extravagant high-rise rooftop party you have ever seen. Outside of Awkwafina’s chicken joke, the most talked about scene is likely to be the production value behind a wedding that occurs in the movie. It’s one of the most creative and visually stunning receptions ever captured on screen. “Crazy Rich Asians” offers a lot of enjoyment for all audiences, it’s the type of well rounded film that everyone can find something to relate with. One of the more enjoyable entertainment experiences this summer.